A brief introduction on mesolithic and neolithic Scandinavia leads into the bronze age archaeology of sun wagons with spiral-adorned discs and women's belt discs with the same symbolism. Then we turn to the völur, Norse seeresses, , as depicted in the Icelandic Edda and various sagas as well as in archaeological finds of women with ceremonial staffs and other regalia. The presentation looks at Scandinavian iconography and myth, with special attention to sexual politics, including the powerful but often negative view of the giantesses, as opposed to the rather scant pallid account given of most asynjur ("goddesses") with the exception of Freyja. The Norns and the dísir (ancestral women). 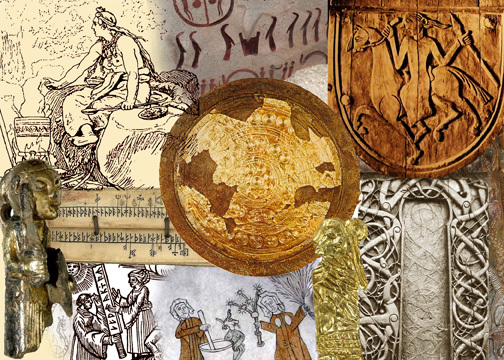 In the middle ages, we view the stone stelas of Gotland and heathen goddesses with animal spirits in early church art; the fantastic wooden carvings of the stavkirks; and runic snake-stones and runic calendars. We also look at female warriors, queen Gunnhild, the sorcery charge, 16th century representations in Olaus Magnus, and female themes in more recent art and folklore. and questions; (also available in a shorter 60-minute version).